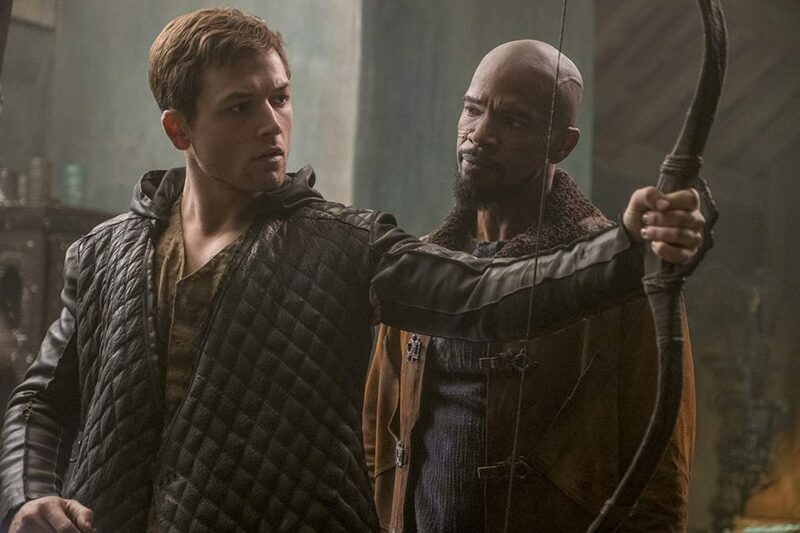 DI: It’s a 2018 re-imagining of Robin Hood starring Taron Egerton (Kingsman). The trailer promises a sexier version of our beloved thief and I’m glad to see that there were no signs of men in tight tights (as much as I enjoyed the song that goes with this imagery). From the very start, the film overturns your perceptions of this classic tale. 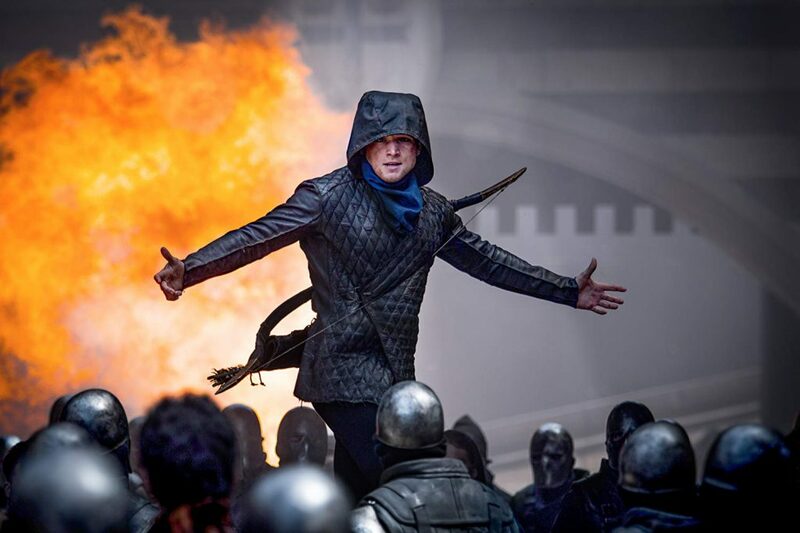 JOSH: Yes, at the beginning, the narration goes out of its way to say that this is a different Robin Hood story to any other we’ve seen before. 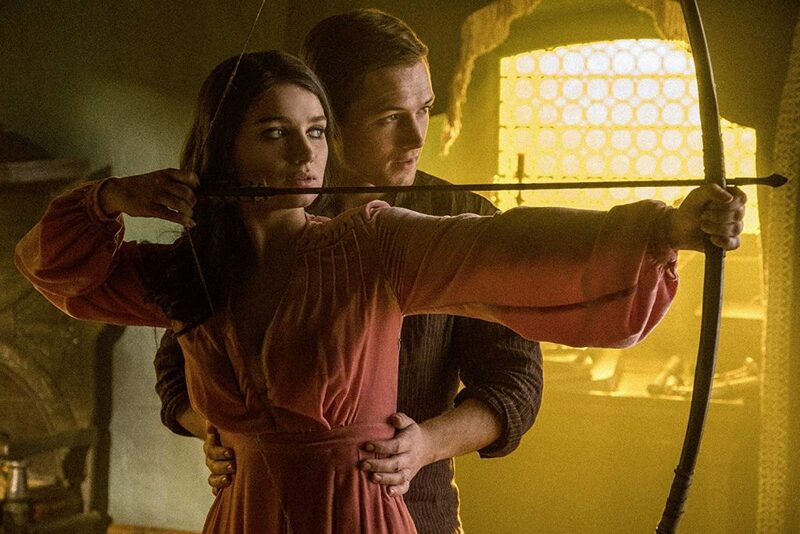 It rips the classic medieval tale into the 21st century. Well actually it’s not exactly clear which century it’s set in… some alternate reality where scientific advancements have happened much quicker and the culture is much more diverse in 16th century England. Which, OK, is a bit strange, but I was on board with this spin on the old classic…at the beginning. DI: I have to say that the trailer set me up to expect anything. Yeah, it’s predominantly medieval. But it’s an artistic, liberal take on it. Which is going to divide viewers a lot. My advice is: if you’re going to see this on the big screen, it’s really worth putting down your need to have things be historically accurate. Go enjoy this movie for its cinematic eye candy. Because – there’s a lot. DI: Can I just interject and point out how everyone seems to have cinema-worthy eyes? Marian’s eyes…mmm…like pools of Tahitian water. Robin…man, he is the perfect guy to be wearing a costume that only shows those deep blue peepers. Even Friar Tuck has those puppy dog eyes that make you feel worse that he’s the Sheriff’s punching bag. DI: Hey, you start each paragraph with “Yes”. JOSH: No I don’t. Stop distracting me from revealing the truth about this terrible movie! I felt like taking a big red rubber stamp with the word “CONVENIENT” and plastering it all over this film, and this is where it all fell apart for me. The constant repetition of every absurd scenario working out in the hero’s favour jarred me out of the story and I really struggled to get past how damn convenient everything was. Why can knights stand in fire and not die; why is Friar Tuck wearing glasses; how can Robin get shot and just walk it off? It’s madness MADNESS I TELL YOU! DI: Okay, take a breather. I think everyone can tell that you and I have differing opinions of this film. Let me just say that I really enjoyed it. What I needed to see was a believable bad guy – and it delivered. 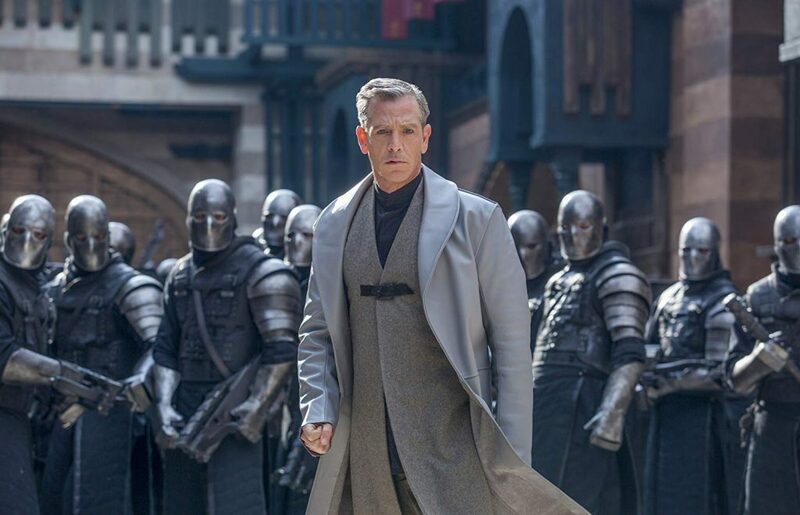 Ben Mendelsohn’s personification of the Sheriff of Nottingham was surprisingly delicious for me. From the first swirl of his coat, to the clink of the ring on his finger, the Sheriff is the kind of person you love to hate. But what I loved most was that he wasn’t an all-evil character. There’s a little crack in his emotional armour where you see why he is the way he is and it makes you hope for redemption. Actually, I think the film set up motivations pretty well. Little John’s (Jamie Foxx) need for vengeance was absolutely heartfelt. I mean, c’mon, the guy saw his son get murdered. If that isn’t a motivation for revenge, I don’t know what is. JOSH: But so much of the original story was lost for this “sexier” retelling. John is never called Little John and I’m 99.9% sure Robin is never even called ROBIN HOOD! He is, however, called Rob a lot, because all the chums abbreviate the lads’ names in medieval Nottingham. For me, this is once again a failed attempted to try retell a timeless classic. To quote a friend, that story hasn’t been done right since an animated movie in 1973. DI: Will you stop angry-typing and let me finish. JOSH: Fine fine, I’m done with this anyway. I’m going to go watch the Disney version to settle my nerves. DI: Yeah, that is a pretty good version. But back to this one. I agree that the film isn’t without its problems. Some character story arcs are waffely. Marian, as the one female character, is set up to be quite an outspoken and potentially strong woman. But what we see is someone who doesn’t really live up to her potential. I’m hopeful though that since the film is set up to have a sequel, we might see more of what she’s capable of. Okay I’ll say no more so as not to give anything else away. So Josh… I’m almost scared to ask. What would you give it out of 10? JOSH: 4 – and I feel like I might be being a little bit generous. DI: HOW IS THAT GENEROUS. I’m going to give it a 7. It did what I wanted it to. Yes, there are plot holes and problematic characters. But this is an action movie. It’s not a biography. I wanted to have fun watching this. And I did. 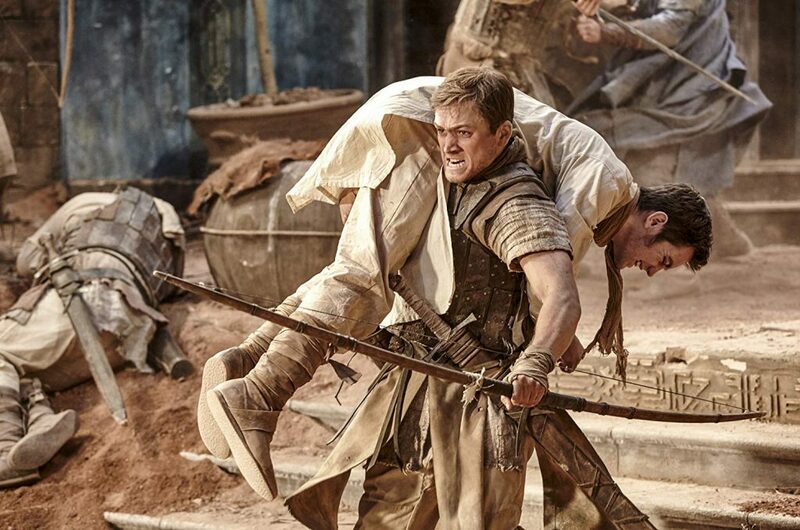 And got to gaze at some really gorgeous cinematography and fight scenes. Oh and eyes. Beautiful eyes.